If your pet is not a dog, cat, or one of the animals listed above, please call the Plant Quarantine branch of Hawaii’s Department of Agriculture to find out the requirements for bringing it into the state: (808) 832-0566 or (808) 837-8413. Has your dog/cat been vaccinated for rabies at least two times during its lifetime? YES: Go to #2. NO: Skip to #10. Were those two vaccinations administered at least 30 days apart? YES: Go to #3. NO: Skip to #9. Was the most recent vaccination administered before the previous vaccination expired? (For example, if the previous vaccination was good for 1 year, was the most recent vaccination administered before those 12 months were over?) YES: Go to #4. NO: Skip to #9. 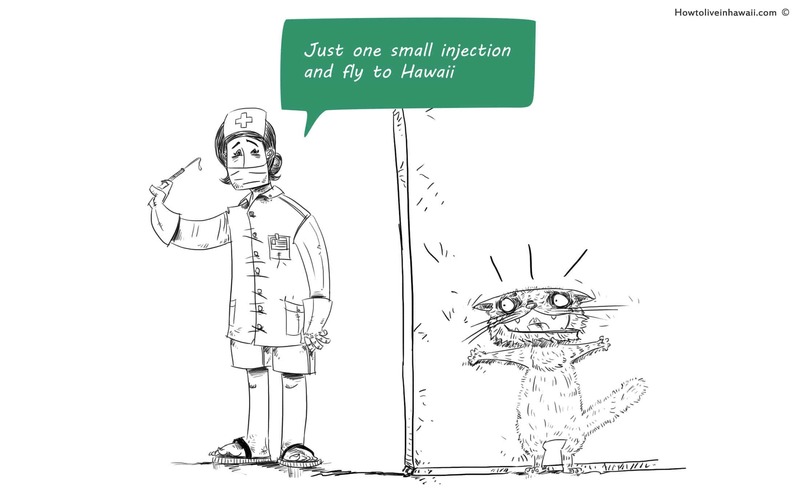 Will your pet arrive in Hawaii at least 90 days after its most recent vaccination was administered? YES: Go to #5. NO: Skip to #8. Will your pet arrive in Hawaii before its most recent vaccination has expired? YES: Go to #6. NO: Skip to #7. Congratulations! Your pet meets all of the rabies vaccination requirements. Skip the rest of this list. Your pet needs one more vaccination. Make sure this vaccine won’t expire until after your pet arrives in Hawaii. Your pet’s arrival date should be at least 90 days after this vaccination, otherwise your pet will be quarantined (at your expense) until those 90 days have passed. Skip the rest of this list. Your pet’s planned arrival date in Hawaii is too early. You have two options: You can keep your pet’s arrival date as is, but your pet will be quarantined (at your expense) until 90 days have passed since its last vaccination. OR you can reschedule your pet’s arrival date so that it is at least 90 days after your pet’s last vaccination. Skip the rest of this list. Your pet needs one more vaccination that’s administered at least 30 days after the most recent vaccination. Make sure this vaccine won’t expire until after your pet arrives in Hawaii. Your pet’s arrival date should be at least 90 days after this vaccination, otherwise your pet will be quarantined (at your expense) until those 90 days have passed. Skip the rest of this list. Has your pet ever been vaccinated for rabies? YES: Go to #11. NO: Skip to #12. Your pet needs one more vaccination that’s administered at least 30 days after the most recent vaccination. Make sure this second vaccine won’t expire until after your pet arrives in Hawaii. Your pet’s arrival date should be at least 90 days after this second vaccination, otherwise your pet will be quarantined (at your expense) until those 90 days have passed. Skip the rest of this list. Your pet needs two vaccinations. The second one needs to be administered at least 30 days after the first one. Make sure the second vaccine won’t expire until after your pet arrives in Hawaii. Your pet’s arrival date should be at least 90 days after this second vaccination, otherwise your pet will be quarantined (at your expense) until those 90 days have passed. As long as the mobile unit can still issue a rabies certificate with all the necessary info, I think it should be fine. To be 100% sure, you can email Hawaii’s Dept. of Agriculture at “rabiesfree@hawaii.gov” to ask them. I remember I had to email them once about something and I heard back within 24 hours, so they are pretty responsive. If you do decide to email, could you please reply to this comment with what you find out? Thanks, Maggie! 1) can any of the work ( shots/ tests etc ) be preformed by a VIP type van/clinic ( a vet who travels to pet stores etc and offers shots etc at a cheaper rate with no office visit fee)? If so, please clarify which parts are accepted by that that type of vet. 2) will you please send me a list if exactly what I need to have done for my three cars and when? I know I can find it online but I am looking for something like: by oct 15 th they need the first if two rabies shots. Then by nov 1st they need —. Then by dec 15 th they need the second rabies shot. Send papers to —- by —– date etc…..
Those certificates you are asking about will be fine as long as the vaccine is administered by a licensed veterinarian and the form is filled out completely as we list on our website and hand signed. In order for any dog or cat (including puppies or kittens) to qualify for a direct airport release you must prepare the animal completely using our 5 day or less checklist (in conjunction with our Hawaii Rabies Quarantine Information Brochure) and meet all procedural requirements, documentation, and waiting time requirements in order to qualify for a direct release. Any pet qualified for the 5 day program is qualified for a direct airport release. Releases are done primarily on Oahu. The dog or cat must have 2 rabies vaccinations separated by a minimum of 30 days. (This works out to 31 days apart.) The earliest a pup or kitten can get a first rabies vaccination is at 3 months of age. If the pet is older and has had previous rabies vaccinations you can use any of the older rabies vaccinations as proof of the earlier rabies vaccination. The current rabies vaccination must have done a minimum of 90 days before arrival and still be valid upon entry into Hawaii. The two rabies vaccinations do not need to be consecutive. A microchip must be implanted and then a passing OIE-FAVN test must also be done followed by a mandatory 120 day wait before the animal arrives, can be done anywhere outside of Hawaii, and does not require the animal be held at any type of facility. That wait period starts the day after the testing facility receives the passing sample. You can check the exact entry date (based only on the blood test) approximately 4 – 5 weeks after the test by going to our website at: hawaii.gov/hdoa/ai/aqs/microchip entering your pet’s microchip number without spaces, periods, asterisks, dashes, etc. Please do not attempt to count out the days yourself. If these requirements cannot be met the animal will enter quarantine for up to 120 days. If you have met all procedural and documentation requirements but bring the pet in before it meets the mandatory wait periods it will complete the remainder of the wait in quarantine. If one follows all procedural requirements for a pup or kitten as soon as possible and within our time requirements, meets all documentation requirements, and mandatory wait periods the pup or kitten would be at least 8 months of age by the time it is qualified under the 5 day or less program. The reason for that is because puppies and kittens can also be rabies carriers therefore they must also qualify under the direct release program. These requirements are set by law and are non negotiable. Any animal prepared completely under the 5 day program is eligible for direct airport release for the $165.00 fee. We set it up as the 5 day “or less” program because too many people arrive with the assumption you can simply take your pet to any hotel. Once we release a pet we cannot accept it back even if the owner has no place to take the animal. 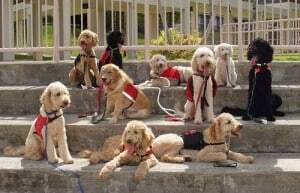 That is what the 5 day program is for and the fee is a $224.00 flat rate for up to 5 days stay in quarantine. Thanks for passing this on, Maggie. I always wondered why they called it “5 day or less” instead of just “direct release” — now I know! Maggie, re: creating a timeline for when to do what — it will vary greatly, depending on your pet’s age, vaccination history, country of origin, etc. My advice is to follow the steps I’ve outlined on my blog in the “Bringing Your Pets to Hawaii” series. I’ve put the steps in the order in which they should be done, and they incorporate all the rules described above by Steve Lee. Looking at a calendar, assign a specific date or deadline to as many steps as you can, following the time restrictions listed in my posts. That’s what I did with my cats — I created a timeline to follow, so I would be sure to meet all the time-related requirements. You’ll feel better once you do this, because you won’t have to worry anymore about missing any deadlines or doing something too early. Just follow your timeline and you’ll be good to go. Good luck!